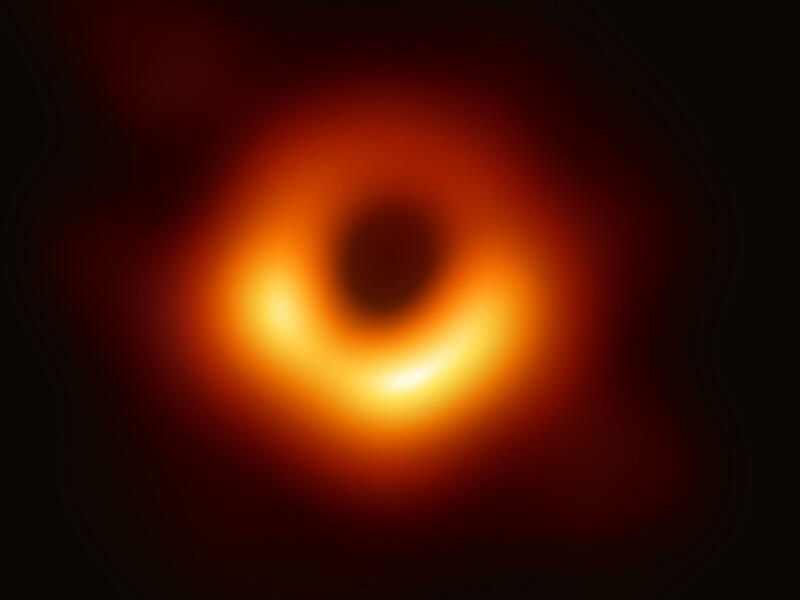 The first-ever image of a black hole was released Wednesday by a consortium of researchers, showing the "black hole at the center of galaxy M87, outlined by emission from hot gas swirling around it under the influence of strong gravity near its event horizon." The world is seeing the first-ever image of a black hole Wednesday, as an international team of researchers from the Event Horizon Telescope project released their look at the supermassive black hole at the center of galaxy Messier 87 (M87). The image shows a dark disc "outlined by emission from hot gas swirling around it under the influence of strong gravity near its event horizon," the consortium said. "As an astrophysicist, this is a thrilling day for me," said National Science Foundation Director France A. Córdova. The enormous black hole is some 55 million light-years from Earth in the Virgo galaxy cluster, with a mass some 6.5 billion times that of our sun. "We are delighted to be able to report to you today that we have seen what we thought was unseeable. We have seen and taken a picture of a black hole," said EHT Director Shep Doeleman of Harvard University. Researchers at the Event Horizon Telescope project say they were able to create an image of a black hole by using a network of eight radio telescopes to create "a virtual telescope dish as large as the Earth itself," the National Science Foundation says. The breakthrough, Doeleman said, came after a decade of work to align the myriad working parts of the project and gain the highest resolution possible from the Earth's surface. Finally, in April of 2017, he said, "all of the dishes in the Event Horizon Telescope swiveled, turned and stared" at the core of M87. From that data came the image that was released Wednesday. Córdova and Doeleman led a news conference in Washington, D.C., to discuss the team's finding, in an synchronized process that took place simultaneously on four continents, as researchers held press conferences to share news of what they're calling "a groundbreaking result." "You have probably seen many, many images of black holes before," said Heino Falcke, a professor in the Netherlands who chairs the EHT Science Council. "But they were all simulations or animations. And this [image] is precious to all of us, because this one is finally real." Pointing to the screen at the European Research Council's news conference in Brussels, Falcke said that the much-sought-after image "looks like a ring of fire. And it's actually created by the force of gravity, by the deformation of space-time, where light actually goes around the black hole, almost in a circle." Describing the image in Washington, Doeleman said, "The bright patch in the south ... tells us that material moving around the black hole is moving at light speeds — which is also consistent with our simulations and predictions" based on Albert Einstein's theories. As for its broader implications, Doeleman said that by capturing the image of a supermassive black hole at the core of a bright galaxy, "We now know clearly that black holes drive large-scale structure in the universe." "As with all great discoveries, this is just the beginning," he added, predicting the image would open new avenues for study and research. The newly imaged black hole is some 100 billion kilometers across. But despite its massive size, anyone trying to find it in the night sky from the Earth's surface would face the same challenge if they stood in Brussels and wanted to see a mustard seed in Washington, Falcke said. It's well-known that a black hole's gravity is so overpowering that even light cannot escape its center. But black holes also dramatically affect their surrounding space, most obviously by creating an accretion disk — the swirl of gas and material that rapidly orbits their singularities. "Black holes are the X-games of physics. They represent an unexplored extreme of space-time," as astrophysicist Adam Frank wrote for NPR in 2017. "While we now have good indirect evidence that they exist, getting a direct view of a black hole is the ultimate dream for a lot of physicists." For years, a breakthrough in black hole detection promised to answer a question that has dogged scientists since Einstein proposed the existence of black holes in his general theory of relativity: How do you document the presence of something that's invisible? As it answered that question, the EHT project team also published six research papers in The Astrophysical Journal, laying out their methodology and findings. A simulated illustration of a black hole shows the turbulent plasma in the extreme environment around a supermassive black hole. Researchers say they have created the first image of a black hole. EHT telescopes are arrayed around the world, from Antarctica to Arizona and from Mexico to Spain. Before scientists can analyze data collected by the network, a painstaking process must take place. Each signal received by the telescopes must be synchronized wave by wave, using atomic clocks and a supercomputer to correlate and combine observations from around the world. It takes many hours of observations to record enough data to create an image. "Like a time-lapse exposure, this slowly builds up an image of even a very dim source," the NSF says. "It also allows Earth's rotation to, in effect, fill in the empty spaces in the array to produce a more complete picture." In a few weeks of observing the black hole, the EHT project amassed 5 petabytes of data, which Dan Marrone of the University of Arizona said was equivalent to 5,000 years' worth of mp3 files — or "the entire selfie collection over a lifetime for 40,000 people." The task of correlating huge amounts of data, sifting through noise, calibrating information and creating a usable image was a "very significant" part of the project, Marrone said. "They deserve an enormous amount of credit for their diligence and dedication," Marrone said, "because without it, we couldn't have made an image." Some of that work took place in Massachusetts, at MIT's Computer Science and Artificial Intelligence Lab, where computer scientist Katie Bouman "led the creation of a new algorithm to produce the first-ever image of a black hole," the lab said Wednesday. Bouman, who was a graduate student when she began working on the project, gave a TEDx Talk in late 2016 in which she discussed the challenge of using algorithms to "piece together pictures from the sparse, noisy data" from telescopes — without, she added, biasing the system to gravitate toward what scientists might expect a black hole to look like. 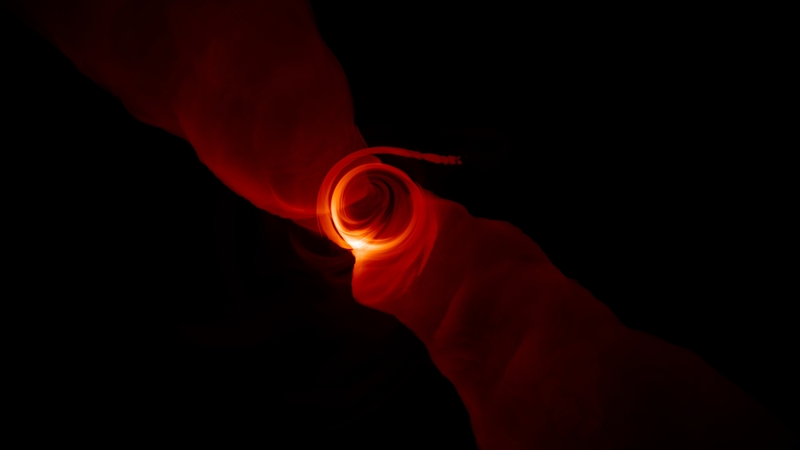 To ensure the final image's validity, the EHT project used a "blind" process, assigning four teams to spend seven weeks working independently to create an image based on data about the M87 black hole that was collected on April 11. When they compared the images, researchers found that all of them depicted a "ring" around the black hole that was roughly the same diameter, with a brighter segment in its southern arc. To find a black hole massive enough to be potentially visible from an Earth-based telescope, Event Horizon researchers focused on "supermassive" black holes that are found at the centers of galaxies. The international collaboration decided to focus on the black hole at the center of galaxy M87 because of its gargantuan size and other characteristics. "M87 is the nearest galaxy with a supermassive black hole that's generating a powerful jet — a beautiful streamer made of plasma travelling at close to the speed of light," said Charles Gammie, a professor at the University of Illinois at Urbana-Champaign who is on the EHT Science Council Board. In a news release about the breakthrough, Gammie said: "One of the great mysteries in astronomy has been how such jets are launched. Our simulations, which are based on the motion of magnetic fields and hot gas near the black hole, showed that the jets are powered by the black hole itself. Magnetic fields act to brake the rotation of the black hole and transfer its rotational energy to the jet." As they analyzed the image and related data, astronomers also grew increasingly confident with other assumptions they've made based on theories about the workings of the universe. "Once we were sure we had imaged the shadow, we could compare our observations to extensive computer models that include the physics of warped space, superheated matter and strong magnetic fields. Many of the features of the observed image match our theoretical understanding surprisingly well," said Paul T.P. Ho, EHT board member and director of the East Asian Observatory. He added, "This makes us confident about the interpretation of our observations, including our estimation of the black hole's mass." NPR's Nell Greenfieldboyce contributed to this report.